The high risk of acquiring diseases due to the contamination of water and air has opened up the market for ultraviolet germicidal irradiation (UVGI) systems. Alarming statistics by the World Health Organizations state that about seven patients out every 100 patients that are admitted acquire hospital-related infections (HAIs). Owing to these reasons, hospitals are making hefty investments in installing UVGI systems. In addition, restaurants, food joints, air-conditioned offices, residential buildings, and cold storage facilities are adopting these systems to prevent the dangerous possibilities of spreading diseases. The Transparency Market Research report on the global ultraviolet germicidal irradiation market states that this market will be worth US$430.3 mn by 2023 from US$168.4 mn in 2014, expanding at a CAGR of 10.9% from 2015 to 2023. The growing awareness amongst consumers about advanced food packaging techniques and hygienic surroundings are augmenting the global UVGI market at a steady pace. This market is also thriving due to the stringent regulations laid down by governments about purity standards and need to control the spread of diseases. The biggest challenge for the global UVGI market is the exorbitant cost of installations. The lack of technical labor to troubleshoot issues pertaining to equipment and systems is also adding to the costs of outsourcing, thereby discouraging consumers from investing in these systems. However, increasing awareness about the hygienic packaging of food and beverages is anticipated to open up new opportunities for this market. The upper room systems sub-segment, which is a part of the air disinfectant segment, is anticipated to be the largest segment in the overall market. Its wide application in areas of heating, ventilation, and air conditioning (HVAC) systems will help the expansion of its share in the overall market. Furthermore, upper room systems are known to consume less power in comparison to other systems, which will boost their demand in the foreseeable future. In addition, the air disinfection UVGI system segment is also likely to play a crucial role in the soaring revenues of this market as emerging economies of China and India adopt UVGI systems in line with developing their healthcare infrastructure. Currently, North America holds the lion’s share in the global UVGI market. This region held a share of 38.3% in the overall market in 2014 followed by Europe, Asia Pacific, Latin America, and Rest of the World. The high incidence of HAIs in North America and the strict US FDA rules to curb them is driving the UVGI market in the region. About one in every 25 admitted patients acquires an HAI. Furthermore, the technological advancements in North America across various sectors is encouraging the growth of the UVGI market. The top players operating in the global UVGI market are Atlantic Ultraviolet Corporation, American Ultraviolet, General Electric, Philips, Halma plc (Aquionics), and UltraViolet Devices, Inc. These companies will have to up their game by providing effective and cost-effective solutions to raise their revenues and achieve their predetermined goals. 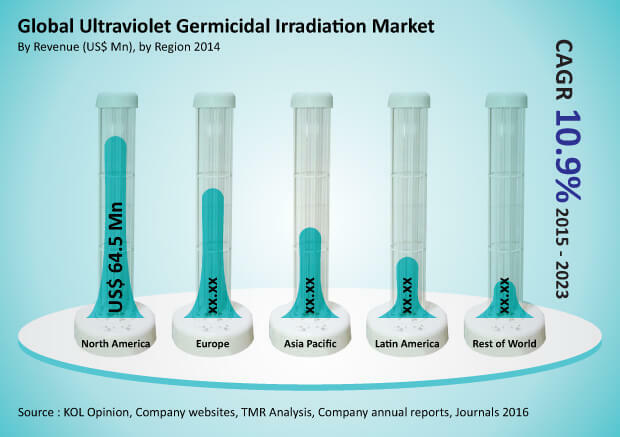 The ultraviolet germicidal irradiation market report evaluates each of the segments and sub-segments in detail for market trends, recent developments, outlook, and opportunities. The market overview section of the report explores market dynamics such as drivers, restraints, and opportunities that currently have strong impact on the global ultraviolet germicidal irradiation market and could influence the market in future. The global market for ultraviolet germicidal marker comprises of air disinfectant and surface disinfectant. Growth of the market is attributed to increased prevalence of infectious disorders and airborne diseases, rising incidence of hospital-acquired infections, and growing hygiene consciousness across the globe. The global ultraviolet germicidal irradiation market has been experiencing steady growth. The trend is expected to continue during the forecast period from 2015 to 2023. Based on type, the ultraviolet germicidal irradiation market has been segmented into air disinfectant and surface disinfectant. The air disinfectant segment has been further divided into in-duct air disinfection, recirculation units, upper room systems, and others (UV barrier system and overhead tank disinfection). The surface disinfectant segment has been categorized into area/room disinfection, equipment & packaging disinfection, lower room disinfection, and others. The market for ultraviolet germicidal irradiation are being developed because of increasing adoption and growth installation of UV germicidal lamps and other devices in U.S. in the past few years. The air disinfectant segment is likely to witness the fastest growth due to easy usage of UV germicidal lamps and low cost of installation and maintenance. The market segments have been extensively analyzed based on usefulness, efficacy, revenue, and geographical coverage. The market size and forecast in terms of US$ Mn for each segment has been provided for the period from 2013 to 2023. The report also provides the compound annual growth rate (CAGR %) for each market segment for the forecast period from 2015 to 2023. Additional information such as recent developments in ultraviolet germicidal irradiation, market dynamics, and value chain analysis, provided in the market overview chapter would assist new and existing players to venture and explore latent market opportunities in impending years. The stakeholders of this report include companies involved in research and development and applications for UV germicidal irradiation. In order to provide a snapshot of this market to the stakeholders, executive summary section is included in this report, which summarizes the market size, trends, and competition for different regions. Heat map analysis has been provided in the market overview section to explain the intensity of competition between leading market players operating across the globe. This will help market players to take strategic decisions in order to strengthen their market positions and increase their market shares. The recommendations section included in the report assist the existing market players involved in the manufacture of UV germicidal irradiation products in targeting the emerging economies. The report also profiles major players in the global ultraviolet germicidal irradiation market based on various attributes such as company details, business overview, financial facts, business strategies and recent developments. Major drivers likely to boost demand for and growth of ultraviolet germicidal irradiation products include increase in the incidence of hospital acquired infections and technological innovations. Apart from this, favorable regulatory scenario would assist in fueling market growth. The challenges for market growth include high installation and maintenance cost. However, the report also highlights various opportunities that are expected to boost market growth during the forecast period. The report includes the major key players in the ultraviolet germicidal irradiation (UVGI) market include American Ultraviolet, Atlantic Ultraviolet Corporation, General Electric, Halma plc (Aquionics), Philips, and UltraViolet Devices, Inc.